"Intimate Look at Whitney Houston’s Meteoric Rise and Fall"
WHITNEY is a new documentary detailing the rise and fall of Whitney Houston, widely considered one of the top recording artists of all time. 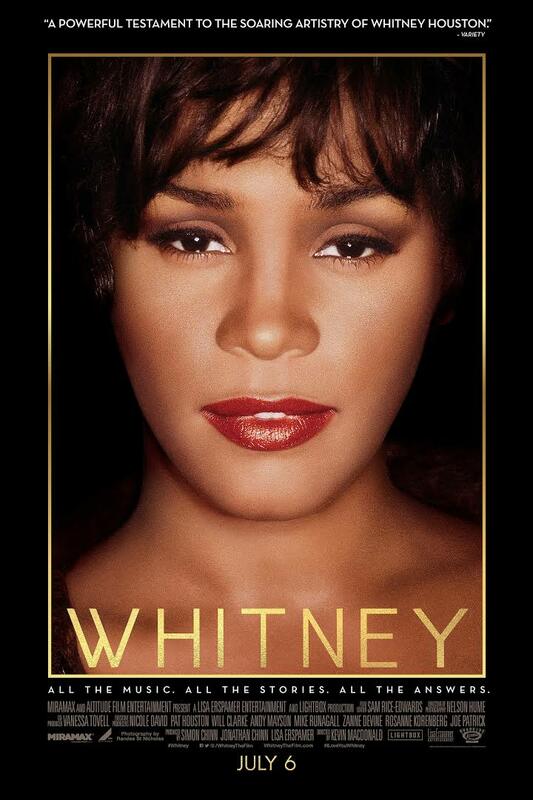 WHITNEY is well done, with a strong Christian perspective running throughout, but extreme caution is advised for lots of foul language, references to substance abuse and domestic abuse, and examples of the inner demons and devils that plagued Whitney Houston’s short life. WHITNEY is a new documentary detailing the meteoric rise of perhaps the 20th Century’s most iconic and successful female recording artist. It begins with a sort of metaphysical montage of flickering images, showing glimpses of good times and bad, overdubbed with Whitney’s voice as she describes a recurring disturbing dream. In that dream she’s running across a bridge, praying to God, as she tries to escape a monstrous figure chasing her. She describes the figure as the Devil, but concludes that the Devil was never able to catch her. This dream sets the tone for the rest of the movie, which pits Whitney’s idyllic life against her inner demons that would eventually cause her downfall. The movie has a continuous Christian thread that runs through it and returns back to Whitney’s roots in the Baptist church on numerous occasions. Her family credits the church for training Whitney musically, and teaching her to sing with the Gospel soul that became her brand. Her mother, Cissy, was a backup singer for some of the top female singers of the 1960s. Cissy groomed her daughter to take her talents which were perfected in church to the mainstream. Every living member of Whitney’s family is interviewed, and they shape the early life of the singer as a sort of “Cosby Show” of the 60s and 70s. However, her father was no Cliff Huxtable. He was a politician and a hustler, and later it’s revealed that a more distant family member had secretly molested the children while the parents were away. The movie transitions to the start of Whitney’s career, her signing with a record label and then jumps to her touring life. Not much time is spent on her first successes that catapulted her to fame. Years of her life are seemingly skipped as Whitney goes from church girl to recording star. Her backstage life is shown as a juxtaposition of prayer and drugs. One minute her brothers are buying cocaine and chasing girls, and the next they’re reading from the Bible as Whitney prepares to go onstage. Her mother curses and talks trash about someone and not more than two minutes later is talking to her daughter about God’s plan and provision. The movie’s last half gets into the major changes that began to weigh on Whitney. It begins with her meeting Bobby Brown, who would eventually become her husband. This is after the turmoil of trying to keep an implied lesbian relationship with her friend (and manager), Robyn, under wraps. Bobby is accused of having a negative influence with his more worldly ways. When the two have a baby girl, there’s a lot of discussion from family members about how the girl wasn’t treated well by her parents. As drug use and misbehavior increase, the movie quickly winds down to Whitney’s death into a discussion about why the brightest star of her generation fell from the sky. This portion of the movie seems to assume prior knowledge of these events, leaving some questions for viewers being introduced to the singer’s life for the first time. As far as documentaries go, WHITNEY is certainly entertaining and well put together. The home video footage of a young Whitney Houston singing in church, hanging out at home, or performing in clubs helps tell the story in a more lively way. This footage is supplemented with footage from the 1960s in general, setting the stage for what America at large was going through during Whitney’s career. Images of race riots, Vietnam, Reagan, the Gulf War, Saddam Hussein, the space shuttle, etc., set the context. Interviews with her family and close friends provide intimate details that reveal both the good and the bad Whitney didn’t allow the rest of the world to see. The only downside is the movie skips some details that only those with a prior knowledge of her life and career might be able to fill in themselves. WHITNEY has a strong Christian theme. Whitney’s career and singing talents are repeatedly referenced in the context of the church, with footage of her singing during services. She talks about her talents as a gift from God and the plan for her life that God is shaping. Prayer and Bible readings are depicted, God is brought up quite a bit within the confines of the Christian faith. However, the movie also addresses the “demons” that haunted Whitney. Lesbianism, sexual misconduct, drug use, and domestic abuse are all discussed. There’s also a fair amount of swearing during the interviews and some archival footage. Race relations are also a part of the movie as they discuss what life was like for blacks during the 1960s, and Whitney transitioning into the mainstream of white culture as she became famous. Some remarks made during the interviews about race have a liberal perspective, and the Star-Spangled Banner is accused of being hostile to blacks, thus highlighting why many don’t fully respect it. However, Whitney is depicted as embracing patriotism with her acclaimed national anthem performance at the 1991 Super Bowl. Also, she seems to have adopted a colorblind approach to her life. That said, because of the foul language and references to personal problems, including substance abuse, makes WHITNEY inappropriate for children. Extreme caution is advised for adults. Whitney’s father steals money from her and sues her because of his greed, parents mistreat their daughter by not taking proper care of her. WHITNEY is a documentary detailing the meteoric rise and fall of popstar Whitney Houston. It begins with Whitney Houston describing a recurring dream as she runs away from the Devil while praying to God. The movie focuses on her Christian upbringing and faith, crediting the church as developing her talents. It uses archival footage from her childhood to help paint that picture, then jumps into her career, choosing to spend little time on her rise to fame while diving into her touring life. After meeting her future husband, Bobby Brown, things begin to change. The movie addresses a myriad of inner demons Whitney kept hidden from the world. WHITNEY is entertaining and well produced. Home video footage helps tell the story in a more lively way. Interviews with family and friends provide intimate details about the good, the bad, and the ugly. The movie skips some details, however. Whitney’s Christian upbringing and behavior take center stage, but there’s lots of foul language and references to substance abuse, domestic abuse, and Whitney‘s inner demons. WHITNEY isn’t appropriate for children. Extreme caution is advised.